The weather has been more favorable this summer than 2016! However, the moisture through early August has presented some issues. 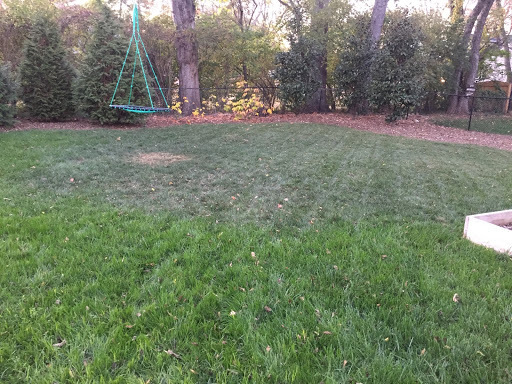 The crabgrass preemergent is now been depleted, due to the wet summer. You will notice spurge, crabgrass, and nutsedge invading curbs already. We will get these weeds under control with app# 5,which begins next week. We are also seeing much heavier disease pressure (Brown Patch and Dollar Spot) than normally occurs in August due to the excess late summer rains. Normally, August is very dry and the humidity backs off, both of which reduce disease outbreaks. We have completed all 3 disease prevention apps for those that take the disease control package. You may see some outbreak the last 2 weeks in August. Unless the disease becomes rampant, I don't recommend you spend money for a 4th fungicide this late in the summer, especially if you are on the fall aeration and overseeding schedule. If you do not plan on aerating and overseeding this fall, a 4th fungicide might be worth the $. Call or email with any questions. Fall will be here soon! 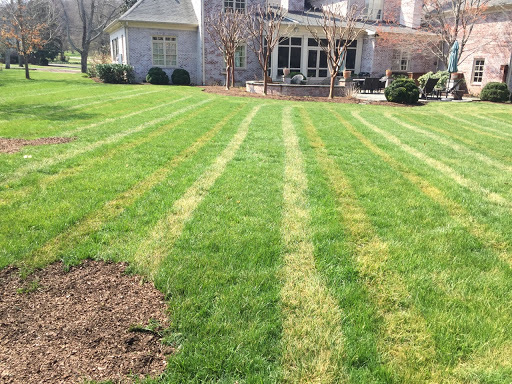 I am looking to barter out services for a full year(or more depending on lawn size) = 6 basic apps, 3 disease controls, and aeration and overseeding. If you have lower bowl preds tickets and if by chance you care more about your grass than one game , PLEASE call text, and email me! 6153946867 I will make your lawn Augusta! Minor side note: we are starting to see some brown patch. All 1st round disease apps will be completed by Friday if weather cooperates! 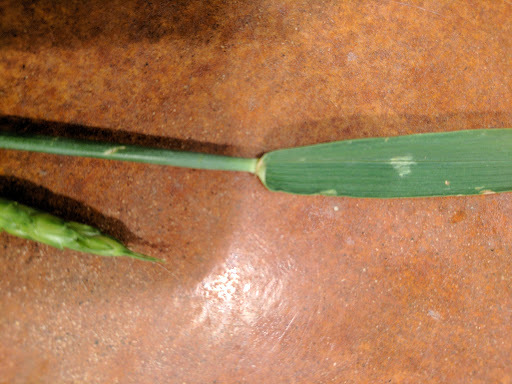 What the heck is growing in my landscape beds and lawn. Looks like white sonora wheat? Anybody know what this is? It came from the straw bales we used as Halloween decorations, but I can't id pasture grasses. 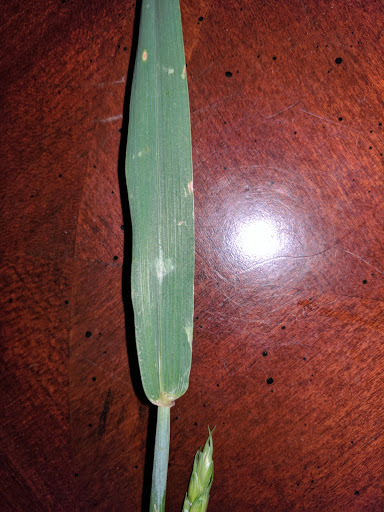 Is this wheat? 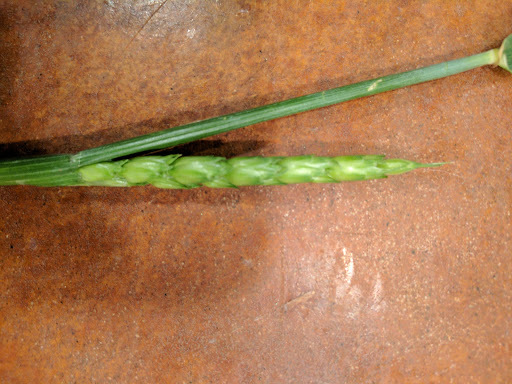 Rolled in bud, insignificant liquile,abe 1 clasping auricle. I received an inquiry from a customer today that included the above picture. From the picture, I thought this was possibly a herbicide injury. 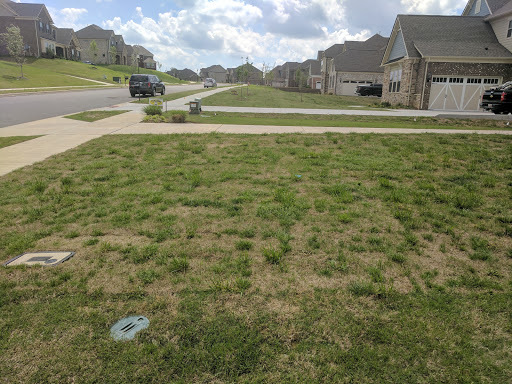 After reviewing our records, I noticed it had been a month since our 1st treatment of this lawn, but the injury appeared last week after a mowing. We assessed all 10 properties treated the same day with a granular polyon slow release fertilizer with preemergent incorporated on the granular. Weeds were only spot sprayed. Only 2 yards treated out of 10 had this damage. However, there was a 3rd yard beside the other 2 that had same symptoms. That yard was treated 45 days ago. 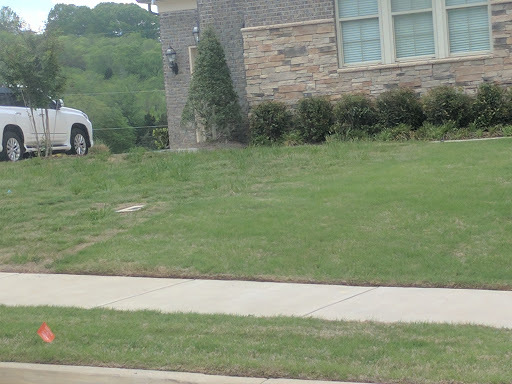 The one common denominator was all 3 yards were mowed the same day, same height, by the same company. The damage is confined to the wheel tracks. These 3 lawns were mowed last week during cold snap, and the lush spring growth had frost on it when they were mowed, causing foliar damage by crushing plant cells with frozen moisture​ inside the leaf blades. The good news here is that it only crushes the foliage, so new growth will soon replace the damaged turf. It will probably take 2 mowings and more warm wet weather for all damage to heal. 1. Never mow or even walk on frozen green grass. 2. It is important to keep accurate pesticide records un to be able to determine if herbicide damage could be a cause of plant injuries. Glad it was not herbicide related! Seeing some serious surface mole tunnels in January is strange. People ask, are they eating grubs??? Nope, because the ground has been thawed and we have had excellent soaking rains, that drives earthworms to the soil surface so birds and moles get a snack. Usually, the soil surface is frozen during January and moles are tunneling deeper, so you don't notice them. Its not like a "mole epidemic", its just a warm, weird, wet January. Having said that, the good news is you can easily push tunnels back down before grass dries and dies with a wheelbarrow or lawn mower wheel right after a soaking rain. Then, you need to trap the moles with scissor traps or call Keith Burgess 615-496-7004. His company us Affordable Wildlife control. He is a mole trapping guru! If you wait until warm temperatures come before getting rid of moles, you will very likely have dead runs of grass all summer. When its warm and soil is dry, the raised tunnels cause grass roots to dry and die pretty quickly. If you are a do-it-yourselfer type, https://www.amazon.com/Victor-OSight-Mole-Trap-0631/dp/B00004RAMY. Happy trapping! All other methods are a joke, trust me! I have tried them ALL.